First published in The Guardian, 30 April, 2014. The more I think about it, the more it seems to me that the development of contrapposto was one of the most important events in the history of art. There was already a few thousand years of stiff, static figures in art, so it was by no means inevitable that sculpted figures would become more naturalistic. Someone had to think it through and break the shackles of tradition. Actually it probably wasn’t someone heroically breaking the shackles of tradition; more that a society had developed that tolerated and even encouraged new thinking. This truly, truly remarkable event happened in Athens, reaching a peak of inventiveness and refinement in the 5th century BCE, before everything started closing down again. I had the idea of contrasting a guy in a relaxed contrapposto pose with a more formal, stylised way of representing the human body. Egypt was the obvious example. Ancient Egyptian art depicted the shoulders and torso frontally while the head, legs and feet were shown in profile. Once I put those two different modes together it was a small step to imagining an ancient Egyptian returning from a holiday in Greece. 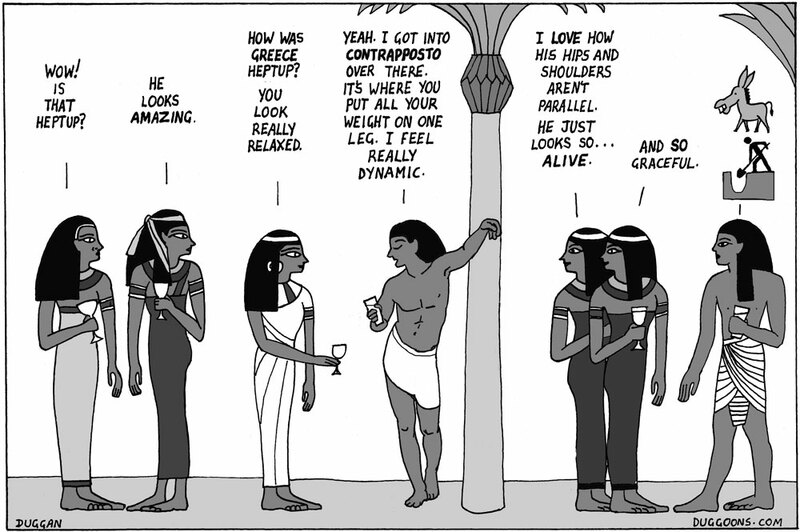 The cartoon offers a pretty good explanation of contrapposto so I won’t elaborate. Over time the concept of contrapposto was pushed further into more twisting, S-shaped curves. If we pretend that the Renaissance was the true and natural extension of ancient classical art (ignoring the gap of more than 1,500 years of Rome and the Middle Ages where they followed different principles) we can see how far and how much fun an artist like Giambologna had in developing intertwining, twisting figures. The word contrapposto is Italian for “counter-pose”. In Greek, however, it means “pulling the carrot out of the arse”. The ancient Greeks were rebelling against the very stiff, formal look of earlier art, which they found really nerdy. It is hard to imagine a Greek sculpture staying at home on a Saturday night. There are many statues of Apollo smoking a cigarette for example. Not only did the ancient Greeks paint their statues but there is mounting evidence that they clothed them as well. A statue of Hermes was recently found wearing a leather jacket. Experts are still debating whether a pair of jeans found on a statue of Heracles had decayed over time or were ripped from the start. No belt was found which suggests the jeans hung low, revealing his underpants. So, so cool. If you like this you’ll love my new book – “Peter Duggan’s Artoons”!